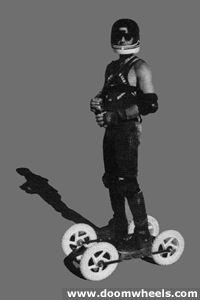 Wheels Of Doom... the first in-line, off-road skates designed to be powered by controllable kites, uses only the wind to reach speeds in access of 55mph. Similar to landsailing, the skater travels across the wind and tacks or gybes to return. On beaches and desert dry lakes around the world, thousands of miles have been skated alongside the three-wheeled buggies of fellow kite traction enthusiasts. Few things in this world are as thrilling and awakening as dipping a 20 foot parafoil into the power zone and accelerating to freeway speeds on skates without bumpers, seat belts or brakes. Bob says "Ride Fast Take Chances!"